skEYEwatch allows users to communicate on a 1:1, adhoc and Group basis. skEYEwatch provides eight distinct Talk Group types each customized to fill a particular mission. Talk Groups range from the basic Nextel type Group, to Groups for Surveillance, Command, Dispatch, Unicast, Emergency Broadcast and more. Each multi-way Talk Group will support 255 members while the Emergency Broadcast Groups can reach up to 60,000 Users with the press of a single button. Everyone has seen truckers, police officers and construction workers use a handheld push-to-talk communications device in the past. Often seen as the microphone used on CB radios, these handheld mics became the de facto standard of vehicle communications for decades. Over the past 10 years, there has been a movement to remove radio frequency usage commonly used in two-way radios from consumer use. This created a dilemma for the industries that required this to stay in contact with their fleet and for their fleet to stay in contact with each other. Cell phones became the logical choice as a replacement and are used, even today. What was missing is the familiar interface and procedures dispatch centers used for so many years. skEYEwatch is proud to have one of the most sophisticated push-to-talk solutions using common communications interfaces and very easy to use software. Vehicle drivers use and almost identical handheld microphones to what they were used to using prior to the removal of two-way radios. By eliminating a learning curve and creating very simple software for both dispatch and in the vehicles, our push-to-talk is second to none. 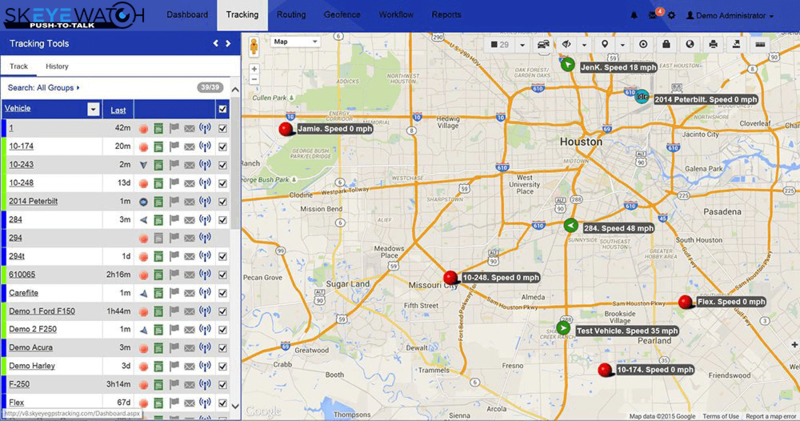 Bundled with our PTT solution, we include a GPS tracking system viewable within our dispatch console running on a Windows PC as well as a smartphone or tablet used in the vehicle. There are so many features packed in this powerful app, it is hard to properly capture them all on this webpage. Call and speak to one of our logistics professionals and we can give you the guided tour on what we think is the greatest push to talk application on the market today. skEYEwatch users can make Private (1:1) PTT Calls from the Map Tab by tapping a map Pin. This will show the Contact Name in an “info-box” above the Pin. Pressing the PTT button with a single Pin selected will initiate a Private PTT Barge Call. Pressing the “info-box” for a full second will open a new menu with additional options, including; initiating a Private Alert PTT Call, sending a secure skEYEwatch Text/Image Message, initiating a phone call or launching navigation to the Contact. skEYEwatch PTT is FirstNet certified and is highly encrypted for complete security. We have partnered with major carriers to provide the best possible coverage in the most remote of locations, making this a perfect solution for any fleet - small or large. skEYEwatch includes functionality to send encrypted multimedia messaging to Individual ESChat Contacts or skEYEwatch Groups. skEYEwatch Messaging includes both Text and Image attachments, each of which are secured with AES-256 encryption. 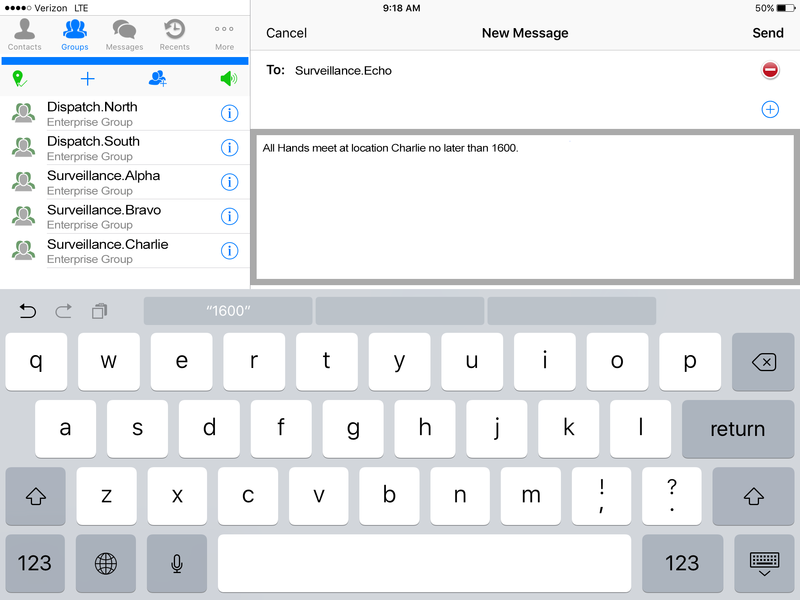 Group Multimedia Messages send on the skEYEwatch iOS, Android and PC Clients are able view message statistics, including the ability to see the number of recipients who have both Received and Opened your sent messages. Enterprise administrators can configure whether messages are stored on the skEYEwatch server after delivery. Options include immediate removal following delivery, or businesses/agencies can select the duration to fulfil public disclosure requirements. You contact us and we give you support! WHAT DOES PTT ACRONYM STAND FOR? PTT is the acronym for Push-to-talk. It depends on how big your fleet is.